Why Does Sirius Move in the Opposite Direction to Precession? Why Does the Rate of Sirius Motion Almost Exactly Cancel Precession? We scientists would claim that in the absence of precession, the tropical year and the sidereal year would be equal. 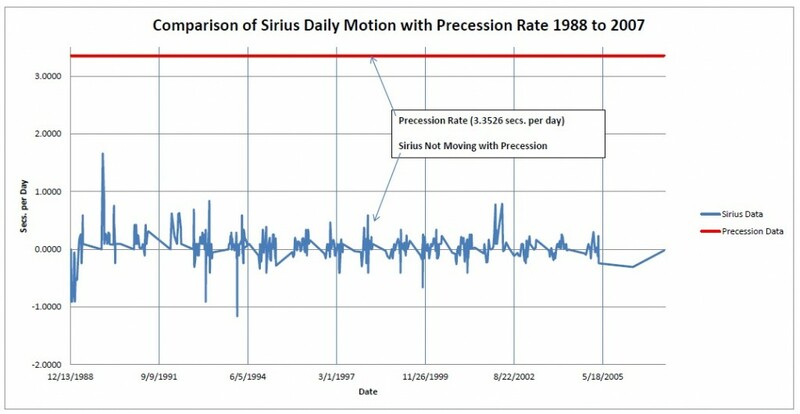 The following graph displays actual measured daily transit readings of Sirius (blue line) and compares these readings to the precession rate (red line) of the rest of the stars in the sky. This clearly demonstrates that Sirius does not precess. The question is—why does this happen? These observations clearly indicate that the so-called ‘precession of the earth’ is NOT a scientific fact, and that the Sirius system has a noticeable gravitational influence on our solar system. Editor’s Note: Though Mr. Homann uses the term “Meridian” in his discussion below, in fact (and as he explains) Sirius didn’t pass directly overhead but rather the telescope was pointed to the Southwest. Also, the article below was prepared before this data was digitized and so his text has been changed only in these items: 1) his original graphs were hand drawn on graph paper and we are able to provide clearer and more readable graphs and 2) his original graphs were originally set up on ten-day intervals and now they are presented on a simple date oriented time line. Here are links to copies of Mr. Homann’s original hand-drawn graphs, which he labeled Graphic1, Graphic2 and Graphic3. Each of the 8 graphs below can be clicked to bring up the pdf data file with the readings that it represents. 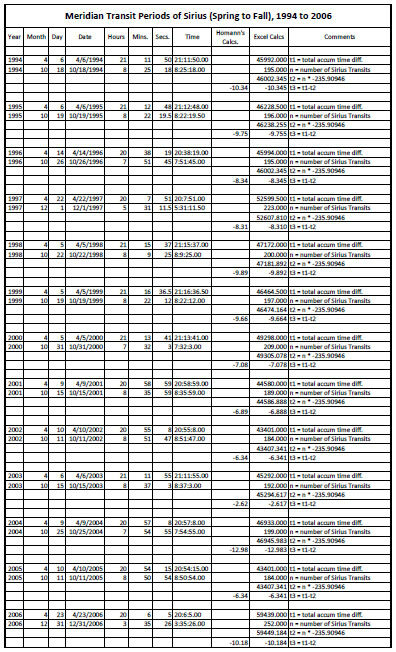 These data files are comprised of Mr. Homann’s original data and the adjacent columns show the Excel calculations for the day length variations (y-axis) per day. This is the actual measured variation around the central value of 235.9094618 seconds, which is the difference between the length of the sidereal day and the mean solar day. Finally, the pdf data files show the term “Calculated Avg =>” to show where we added interpolated points to provide continuity in the lines of the graphs. This seems to happen when Mr. Homann was re-adjusting the transit and its tripod. These are mostly evident in his early years and the later data, especially after 1994, has almost no omissions, adjustments or re-calibrations. Further to this, we tried to stay faithful to his hand drawn graphs which were put together from notes that are in the original manuscript. This was done to smooth the appearance of the graphs and they are consistent with his originals (see above). The x-axis is a linear measure of time for the years mentioned. The axis represents ‘mean sidereal time’ of 86164.0905382 seconds per day as a fundamental time-constant. The vertical y-axis represents the daily positive and negative time deviation in seconds from mean sidereal time, as determined by the meridian transit period of Sirius for the days indicated. A basic transit instrument of 25x magnification is solidly mounted. The optic is permanently aligned in a southwesterly direction. This type of alignment offers an optimal period of observation with respect to Sirius throughout the year. The precise time reference signal used to measure the transit intervals of Sirius is the UTC atomic-time radio signal from WWV Fort Collins/Colorado. The following errors of measurement were taken into consideration: The so-called observer’s “personal error” of maximum ± 0.5 seconds between two successive meridian transits of Sirius. In terms of overall accuracy this error is of course drastically reduced by longer time intervals between two successive transits, e.g. ten-day intervals. As a matter of fact, a 6-year period between two successive transits, in order to determine a mean sidereal day with respect to Sirius makes such error almost negligible. Furthermore, any periodic and non-periodic time fluctuations, regardless of their cause, are naturally included in the measurement. Hence, absolutely no time corrections have been applied neither to the actual measurement of the meridian transit periods, nor in calculating the mean sidereal day with respect to Sirius. Errors due to factors like optical refraction, aberration, proper motion, geographical position, continental drift, time-signal propagation delay, atmospheric conditions, etc were found to be insignificant with respect to the above method of measurement. A thorough analysis of the data would require a comparison with data obtained over the same time periods by the International Earth Rotation Service, US Naval Observatory or NASA, for example. As the following graphs show, several major and minor fluctuations in sidereal time have occurred over certain periods throughout the years 1989 to 2000. For instance, a significant deviation from mean sidereal time occurred in the spring of 1989, when Sirius A, Sirius B and the sun were in direct conjunction and earth was still in the perihelion section of its orbit (see also diagram Solar system – Sirius system). Interesting is the fact that also a major time deviation from the negative into the positive range occurred during this conjunction at the end of February 1989. Furthermore, seemingly ‘regular’ fluctuations appear around March of each year. Also, at the end of 1989 towards the beginning of 1990, as earth went through its perihelion, significant positive deviations were observed. In the following years, around the same period, only positive deviations occurred, although diminishing in magnitude. On April 6, 1994 the transit instrument was aligned in a more westerly direction in order to extend the observation period into the month of June. This presented a challenge, as the bright light of the sun made Sirius almost invisible to the naked eye. However, I was able to detect Sirius on the 21 of June as it went through the transit. This was only possible due to an approximate pre-determination of its position by computation, based on the previous measurements. These particular observations have shown that over a period from the beginning of May to June 21, a daily positive deviation of Sirius from mean sidereal time occurred by about 100ms per day on average. Extended sidereal time-measurements from 6 April 1994 to 6 April 1996 revealed a total negative time deviation of 1.6 seconds from tropical-sidereal time. According to ‘precession’ this difference should be about 3.34 seconds per year. Hence a total negative deviation of about 6.68 seconds was to be expected, but did not occur in reality. The continuous measurement of 6 April 1994 to 5 April 2000 confirmed this fact conclusively. In that period the total negative deviation of ‘Sirius time’ from the total mean sidereal time accumulated to 4.1 seconds. This means about negative 0.68 s per year (!). Again, according to ‘precession’ a negative time difference of 6 × 3.34 s or about 20 seconds should have occurred, but did NOT occur with respect to Sirius! As a matter of fact, the mean rotation period of the earth relative to Sirius is nearly identical to the time interval of the mean sidereal day of 86164.09054 seconds. Significant time deviations in earth’s period of rotation, as measured with respect to Sirius have occurred over certain months (e.g. in the spring of 1989, when Sirius A, Sirius B and the sun were in direct conjunction). Some minor, but nevertheless distinct deviations appear at regular yearly intervals (usually around March). Since these deviations occur annually, the gravitational influence of the moon or perturbations caused by other planets in the solar system can be excluded. Since such deviations from mean sidereal time CANNOT be caused by an increase or decrease in the speed of earth’s rotation, I suspect a combined ‘gravitational’ effect of the sun and the Sirius system on the earth’s axis of rotation. In my article “Some more thoughts on gravitation” I have tried to describe how the Sirius system might be responsible for a ‘curvature in space’ that can reach as far as to our solar system. As we know, the revolution of Sirius B and Sirius A around their common center of gravity over a period of about 49 years proceeds in an almost vertical plane relative to the planetary plane of our solar system. This motion could cause a periodic fluctuation in the curvature of space, similar to an ocean where a calm wind would create long-stretched waves. If a ship were to sail on such waves, its mast will gently swing back and forth. Likewise, during the earth’s orbit around the sun the axis of the earth would ‘oscillate’ due to these periodic fluctuations of the space-curvature between sun and Sirius. Although the speed of earth’s rotation remains unchanged (! ), a positive or negative time-deviation from mean sidereal time can be measured, depending on the magnitude and direction of the oscillation of the axis, the sidereal point of reference and the latitude on earth from which the measurements are taken. As a matter of fact, the International Earth Rotation Service observes significant daily variations in earth’s sidereal rotation period. It is also very important to remember that despite some major variations in earth’s period of rotation, the mean time interval of the sidereal year or earth’s complete orbit period basically remains constant. The meridian transit measurements of Sirius have shown that neither a time difference of 6 × 1223 s, nor a difference of 6 × 3.34 s has occurred over the 6-year observation period from April 1994 to April 2000. These observations clearly indicate that the so-called ‘precession of the earth’ is NOT a scientific fact, and that the Sirius system has a noticeable gravitational influence on our solar system. Obviously, Newton’s laws of gravitation cannot explain Einstein’s universe. In that respect, it requires further study to see if the 49 year cycle of the Sirius system can provide us with an explanation of the large fluctuations and annual irregularities in earth’s rate of rotation that have also been observed around 1941 by experts at the US Naval Observatory. Two other phenomena should be mentioned that took place during the conjunction of Sirius A, Sirius B and the sun around the beginning of February to the end of March 1989, as the function of the time deviation entered from the negative into the positive range (see Graph 1). During this time our outermost planet Pluto, whose revolution period of 248.421 years is exactly 5.0004 to 1 in relation to the Sirius B – Sirius A’s orbit period of 49.68 years, went through the perihelion of its very eccentric orbit. On 23 March 1989 an 800 m long ‘rock’ came in strikingly close proximity to our earth at a speed of about 70.000 km/h. Missing our earth by only a few hours – thereby sparing us a gigantic catastrophe – it also went through its perihelion between sun and Sirius. Thanks to astronomers, who discovered it as it already disappeared again into the vastness of space, a major widespread panic was avoided. These celestial phenomena are not subject to plain coincidence, but are lawful celestial mechanical events. In fact, the Sirius system determines the second (empty) focus point, which is essential for the elliptic orbits of these and other celestial bodies in our solar system. Keep in mind that even our earth has its perihelion around January 2, as it passes through the conjunction of sun and Sirius each year.